Recently, Kaiser Permanente created a 38-page document on how to “deal” with parents who don’t vaccinate. It’s hardly the first of its kind — doctors nearly spend more time in medical school and conferences learning how to coerce, than about vaccines themselves — but it’s just more proof that they don’t care at all about informed consent. You can access this document HERE. Be warned: it’s a disgusting example of how to avoid addressing a parent’s actual concerns, and simply manipulate them into doing what they want (vaccinate). It has no place in any professional’s practice. Because doctors are increasingly being given this script, we’re going to teach you a script on how to combat this type of propaganda. First, let’s learn how to recognize when this is being used on you. “Cognitive Ease” means, don’t engage the parent’s brain or ask them to think through their decision. In fact, specifically avoid making them think critically, because they’re more likely to just agree if they aren’t really thinking. “Natural assumption” means stating that the child will be getting vaccines. For example, “It’s time for little Timmy’s vaccines today, so I’ll go ahead and order them.” Don’t ask the parent if they want them, don’t leave room for disagreements, just make assumptions. “Advantageous terms” means that they will repeat key phrases like “protect your baby” to manipulate you and make it seem most beneficial to vaccinate. In addition to these four points, they also recommend an “emotional appeal” where you tell scary stories about babies who get very sick or die from diseases. They recommend avoiding answering direct questions or concerns, and instead, trying to convince parents that they’re on the same page with wanting to ‘protect’ the baby. Basically, they don’t want to have an honest discussion, they don’t want to answer your questions, they don’t want you to give informed consent. Their ONLY goal is to convince you to vaccinate, and if they do, to praise you for making the ‘right’ decision. New parents are often worried about doing the right things, and keeping their baby healthy and safe. There are a lot of conflicting pieces of advice flying around about everything. Plus, mom’s hormones are all over the place, she’s probably sleep-deprived, and she’s is a very fragile place. When someone is in a vulnerable, emotional state, they’re not thinking at a higher level — engaging in critical thinking. They’re making decisions based on gut feelings and beliefs. While peoples’ minds can be changed, over time, by facts (if their original decision was fact-based to begin with), it is easier to simply manipulate them. It’s true that emotion can’t be countered with fact. And, it’s often true that new parents are at the very beginning of their vaccine research, or have only ‘heard’ a few things and haven’t really dived in. They are vulnerable to being manipulated because their beliefs aren’t firm yet and aren’t grounded in actual information. Doctors are counting on this. People also, naturally, want to feel a sense of belonging. They want to feel understood, accepted, and they want to be praised. They don’t want to be looked down upon, or thought of as doing the wrong thing, especially if that wrong thing could place their child at risk. Doctors are preying on this. They are trying to make you feel like they’re on your team, even when they’re actually narcissistically manipulating you. They want to pretend to hear your concerns, while plotting their next move. They want to give you their approval, from their position of “authority” over you. Here’s how to deal with this. First, take a deep breath. You are not the first parent to deal with this, and you will (sadly) not be the last. It may feel very uncomfortable to have the doctor and/or nurse frowning at you, telling you scary stories, or even yelling at you. Some may cry or beg or plead with you. But the doctor’s comfort and personal feelings are not your responsibility. You are not seeing the doctor to “please” him or her — and s/he shouldn’t be asking this of you. It’s okay if the doctor is unhappy with you or upset after your visit. If you are feeling especially vulnerable, either at this point in your life, or because you’re not a confrontational person, take along an advocate who has no problem saying no. They can stand up for you and remind you of what you had planned before the visit. They can help you engage your brain and think critically when the doctor is trying to prevent you from doing so. Vaccinating is not “now or never.” If you feel bullied, worried, and unsure about your decision, simply say “Not now.” You should not make a decision based on fear or manipulation. You can always decide to vaccinate later, but you can’t take it back. Don’t give in — wait until you feel truly comfortable. Once you head into the doctor’s visit, be prepared for the conversation that is going to happen. Be ready to call out the doctor’s manipulative techniques for what they are, and let them know that you will be a partner in your child’s health care — or you’ll find someone else who treats you with respect and as a true partner. Set your expectations right away. Don’t mention shots. ‘No’ is a complete sentence. You are not getting into an argument. It will not change anyone’s mind and will waste both your time. Do not rise to the manipulation of ‘protection’ or threats against the baby’s safety. Don’t engage. Ask to move on. At this point, it could easily go two ways…. The doctor’s manipulation script assumes you won’t know what’s happening, and will respond to the techniques. In this script, you know what’s about to happen and are prepared to avoid being manipulated. Don’t give the doctor an opening to argue. Try to avoid the topic all together. The doctor’s goal is to normalize vaccinating, and to make not vaccinating seem like a risky choice. But you do not have to let the doctor play the offense and force you to play the defense. Some may say, “Why not just answer with your concerns when the doctor asks?” If the doctor were seriously asking, and not trying to manipulate you, then honestly discussing your concerns and having a look at the facts would be a good thing. But if the doctor is trying to manipulate you, then this just opens the door to more ways for him or her to ‘deal’ with you. Because it’s hard to know the doctor’s intentions, and most doctors are being trained to manipulate in this manner today, it’s better to just avoid the conversation. Most doctors also don’t have all the facts and aren’t going to share both sides with you anyway — they will only share cherry-picked facts from their side. Your ultimate decision to vaccinate — or not — should not be based on fear. It shouldn’t be based on emotional manipulation. It should be based on you writing down all your questions, and then seeking science-based answers to those questions. Only when you feel that you have all the knowledge, and you are totally comfortable with your decision, should you make one. Anyone who wants you to abdicate that responsibility, stop asking questions, and do what you’re told is not on your side. They do not consider you an intelligent person, nor a partner in your child’s health care. They see you as a parent to be “dealt with.” I suggest not continuing to employ such a doctor, and looking for one who has actual respect for you. 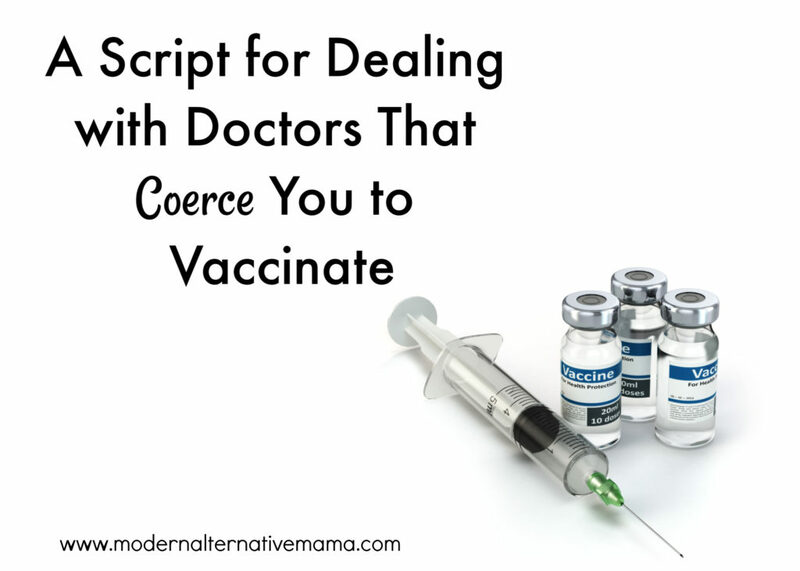 Have you been coerced into vaccinating before? When my kids were young (they’re now 39, 37, 35, 33 and 27) and I didn’t know Canadian law (I immigrated to Canada when marrying my Canadian husband, and my first daughter came along 10 months later), my doctor manipulated me into vaccinating. She would claim that I had to vaccinate, or my children wouldn’t be allowed to attend public school. Which was an outright lie – then it was very easy to get an exemption. And even all these years later, all my 24 grandchildren have exemptions. They don’t even question your reason as to why you don’t want to vaccinate. Now it is made harder – you have to go to a vaccine propaganda session (they call it an information session), and have your exemption signed by an attorney. But vaccines are still not mandatory for attending school. Unfortunately, many parents don’t know that there is an easy way out, the newspapers, the schools and the doctors STILL tell you that your kid can’t attend school without vaccines. Of course, they are then contradicting themselves, when the headlines tell you that ‘only unvaccinated kids got sick in this mumps outbreak’ (which was another lie, because the parents, who were fully vaccinated got mumps as well, and some vaccinated kids got it, but the doctor refused to diagnose it as mumps, because they were vaccinated). I went along with the natural assumption a long time ago, ended up with a brand new peanut allergy from my flu shot! Lucky that’s all I got. When my son was an infant, a PA practically started crying because of babies dying from whooping cough because I said no to dtap. She told me I was killing babies. Should have reported her. Yes. When my daughter was almost 3 the pediatrician told me she had fallen behind on her schedule and needed six vaccines at the one visit. I asked if it was safe to do so many at once and the doctor replied that there were no studies suggesting it was any more dangerous than one at a time…. By the third shot my child’s eyes were glazed and unfocused. By the last she was inconsolable and from that point on we had developmental regression among other symptons, which the doctor said had absolutely nothing to do with the shots the day prior and promptly changed her computer records to state she only received an MMR booster that day (DTaP and others were used but not listed in her medical records). These people are monsters. My mom was recently coerced into a Tdap shot at 65 y/o. The Kaiser doc completely ignore the fact that she was still recovering from the flu and she ended up with whooping cough. She now believes me 100% on Vaccine injuries and doctors blind obedience to big pharma. When she confronted the doc he threatened to call security…my Mom is 105lbs and never once yelled. She fired him immediately. I haven’t been back to Kaiser since my son was 6 mos. Dr. Ng of Kaiser, Martinez CA (of course CA – worst state in the 50) wouldn’t drop the conversation about shots so we let him go. I told him he wasn’t my primary Ped and to stop calling us for regular check ups. I was coerced into giving my first child one vaccine at 4 or 5 months old. I don’t even remember how she did it, but I did more research and realized that I had been manipulated into doing something that instinctively felt wrong and that never happened again. I am curious whether you would see any value in asking a Dr to go through (the actual) vaccine insert with you? If nothing else is this likely to get the Dr to actually read the insert? Maybe start some education. Great article! FYI, the Kaiser Permanente document link is ‘expired’. Looks like it was moved? The link to the 38 page Kaiser Permanente document is broken/weird. Interesting read. Food for thought. The link to the Kaiser guide doesn’t work. I would be interested in reading that. Wonderful article!! I would add,”Dr,. Do you mind if I record our conversation that appears to sound threatening to me, and my child so that I can have a copy for my lawyer,and for the patient human resource Dept here at the hospital who represent patient advocacy!!! So we went for our 2 month well check on march 12. Our son also has Down syndrome so he is special needs. When we told our doctor we would not be vaccinating, he became very angry. He said my research was “hogwash”, and that’s why “he’s the doctor.” He went on to tell us that we were putting our child and others at risk of death. And made us sign a form stating we would not be vaccinating and that he discussed the risks of death with us. He also told us that most providers weren’t taking patients if they weren’t vaccinating. At this point I was furious. Luckily my husband was there and told the doctor we would be happy to look at his information on vaccination and would get back to him. The doctor came back with info, handed it to my husband and walked out. It was a horrible experience. Obviously we won’t be going back and will NOT be vaccinating. But it was a terrifying experience. He was extremely insulting and quite the bully. I feel sorry for all that have to go through that. As a father, I would never let any doctor put poison into my children. I went to every checkup, and wellness visit (vaccination manipulation) my kids had. No doctor would ever even think to cross my path in any decision. I never raised my voice, or tried to argue with them, I just said, “No thank you.” Every time they say anything, just look them right in the eye and say it. Fathers need to step the hell up and protect their families. Stop being the babies you are and stand up for your children. Mothers are strong, but together you can be unstoppable. Moms, tell your partners to wake up and get with the parenting and stop being cowards. The link worked for me. Its a PDF download. Stopping by with a different opinion and some honest questions. Let me preface by saying both of my children are “up to date” on all recommended vaccines. I was pleasantly surprised to be provided vaccine information before each and every one of my children’s vaccinations and I was asked respectfully each time if I had any questions or concerns and if I would like for my children to receive any of the recommended vaccinations at that visit. I also had to sign consent forms for the vaccinations to occur. When our pediatrician and I discussed at one visit that my eldest son needed a delayed vaccine schedule due to medical issues, she was my ally, not my adversary. What actually convinced me to vaccinate, however, was not what the doctor said or didn’t say; it was the result of my own research and was the reality that, while some vaccines are less effective (like flu and chickenpox) the tetanus shot in particular is very effective and I wanted my children to receive Dtap. I’ve heard many people’s reasons for skipping or delaying only specific vaccines, like MMR, flu or HPV, but this is different than skipping all vaccines entirely. I am curious as to the reasons for completely skipping ALL vaccines, though (beyond religious, as that doesn’t seem to actually be the prevailing reason)…what is the reasoning for skipping vaccines for bacterial meningitis (MCV), polio (which is oral) and tetanus/Dtap?